If you are looking for outdoor activities in Queens, New York, the largest of the five boroughs of New York City, head over to Flushing Meadows Corona Park. It is the largest park in Queens nestled between the Flushing and Corona neighborhoods. The park can satisfy your need for an outing almost any day of the year. Flushing Meadows was once a swamp and an ash dump, but now it's a great place to stretch your legs or ride a bike. There are also museums, sports, history, a zoo, and more to check out. The biggest draws are the Major League Baseball Mets at CitiField and world-class tennis at the U.S. Open. Iconic images from the park include the remnants of buildings from past World's Fairs, like the Unisphere, which is a symbol known to represent the borough. The World's Fair was held in Flushing Meadows Park twice: once in 1939-40 and again in 1964-65. Two towers from the 1964-65 World's Fair, which were featured in the blockbuster movie Men in Black, still dominate the area's skyline. In addition to the Unisphere, other facilities from the fairs include the New York State Pavilion (which houses the museum and an ice rink), numerous statues, and monuments. 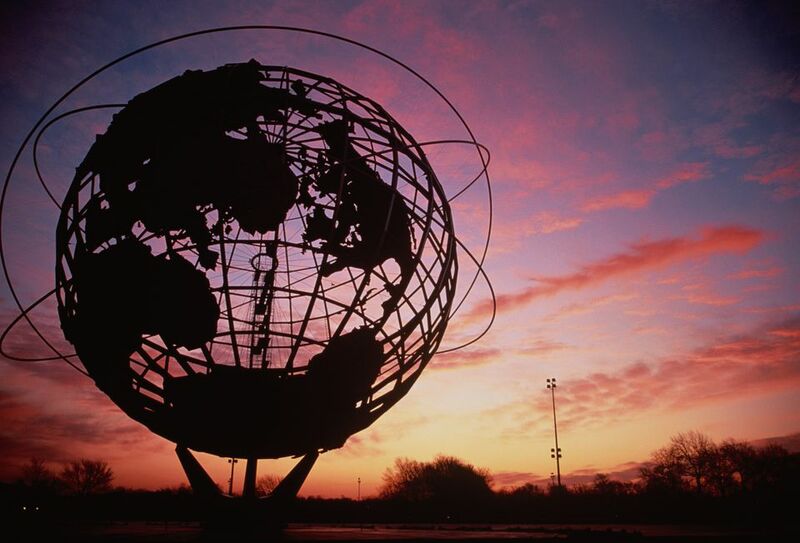 At 1,255 acres, Flushing Meadows Corona Park is one and a half times the size of Manhattan's Central Park. Thousands of visitors come for weekend picnics, strolls, festivals, soccer games, and other activities. There are two lakes, a pitch-and-putt miniature golf course, playing fields, picnic areas, and bicycle rental stands. Originally built for the World's Fair, the playground on the Corona side of the park is a well-used, well-loved neighborhood spot. Kids and their parents come for the playground, and teens for the basketball and handball courts. The park is home to the Queens Museum of Art with an amazing diorama of New York City's five boroughs, the New York Hall of Science interactive science learning center, the Queens Zoo, the Queens Theatre in the Park, and the Queens Botanical Garden. The park hosts several annual festivals, including the Colombian Independence Day Celebration, one of the largest Hispanic events in New York City, and the Dragon Boat Festival, a giant draw for the Asian community. Corona: West of the Grand Central Parkway in Corona, the park consists of grass lawns, the New York Hall of Science, and the Queens Zoo, which includes a wonderful outdoor aviary in a geodesic dome that is open year-round. Central: Overpasses connect the western section to the central part of the park, which is home to the Unisphere, the Queens Museum of Art, the main sports fields, and the Queens Theatre in the Park. CitiField and its parking lots dominate the northern rim of this section, along with the U.S. Tennis Association's Arthur Ashe Stadium, where tennis greats meet every August for the U.S. Open. Southern: Connecting roadways join the central part of the park with the southern section. Meadow Lake is in the southern section, and is ringed by a trail for biking, running, inline skating, and walking. There are cricket fields and fields for baseball, softball, and soccer. Two large playgrounds (one on each side of the lake) are near picnic grills and tables. The boathouse rents out paddle boats and row boats, and a lakeside promenade give folks a chance to catch a breeze at the northern tip of the lake. Continue further south, across Jewel Avenue, and you'll find Willow Lake, a manmade lake during the first World's Fair to serve as a wildlife refuge. Eastern: Separated from the rest of the park by College Point Boulevard, the Queens Botanical Gardens is more readily accessible from Main Street, south of downtown Flushing. The park is home to CitiField, which is the stadium of the National League Mets. CitiField is within the flight path of nearby LaGuardia Airport, but that doesn't distract many from the game. The stadium is north of the Unisphere. Check the ​Mets website for schedules and tickets. Every August and September, the U.S. Open brings the world's best tennis to Flushing Meadows. Often lost in the hubbub are the free (and excellent) qualifying tournament, Arthur Ashe Kids Day, and the juniors championship. There are a number of sporting activities and fields to access in the park including soccer, tennis, mini-golf, cricket, sailing, boating, and other ball fields. Soccer The Hispanic community in Corona often fields fútbol teams in the park. East of the Unisphere there are a number of soccer fields ready for pickup games or more serious affairs. Tennis The U.S. Tennis Association holds the U.S. Open at the Arthur Ashe Stadium and Billie Jean King National Tennis Center in the park. The tennis courts are open to the public throughout the year. There are indoor and outdoor courts, and programs for adults, youths, and seniors. Pitch and Putt and Mini-Golf Try your hand at miniature golf or on the par-3 pitch and putt course in the northwest part of the park. Cricket The cricket pitches or fields are at are at the north end of Meadow Lake, near the lakeside pavilion. They are busy on weekend afternoons. Sailing and Boating The American Small Craft Association offers regular instruction in sailing on Meadow Lake. You can also rent rowboats for outings on Meadow Lake at the boathouse on the lake's east side. Other Sports Players and spectators also enjoy baseball, softball, Ultimate Frisbee, and handball. Softball and baseball fields are on either side of Meadow Lake. Major attractions in the park include watching performances at the Queens Theatre in the Park and checking out the exhibits at the Queens Museum of Art, the New York Hall of Science, the Queens Zoo, and the Queens Botanical Garden. Queens Theatre in the Park The theater stages drama, comedy, dance, children's entertainment, and a film series in its Main State Theatre (formerly a World's Fair pavilion) and its small cabaret Studio Theatre. The theatre also hosts the annual Latino Cultural Festival. The theatre is at the base of the two dilapidated towers and just south of the Unisphere. Formerly the home of the first United Nations, the Queens Museum of Art features work by contemporary and local artists, and houses a gorgeous, detailed scale model of New York City called "The Panorama of New York City." The building was once part of the 1939-40 World's Fair. Check out the museum's permanent exhibit on the World's Fair. New York Hall of Science The New York Hall of Science is one of the country's top science museums. New York City's only "hands-on" science and technology museum, it is a treat for children. The Queens Zoo The 18-acre Queens Zoo (on the western side of the park) focuses on the wildlife of North and South America. It's a good afternoon visit for families with small kids. Queens Botanical Garden Located at the far eastern end of the park, the Queens Botanical Garden is a 39-acre showcase of herbs, trees, and flowers. The garden hosts educational programs on gardening and plant life. The easiest way to Flushing Meadows is by the #7 subway and the Long Island Railroad (LIRR). The #7 subway line stops at Willets Point/Citi Field, above Roosevelt Avenue in the northern part of the Park. The station is surrounded by Citi Field parking. Walk down pedestrian ramps to the main Park or Citi Field. For the Queens Zoo and NY Hall of Science take the #7 stop at 111th Street. Walk south on 111th Street to the Park entrance at 49th Avenue. You can take the Q48 bus to Roosevelt Avenue at Citi Field, and walk south into the park. For the Queens Zoo and NY Hall of Science, take the Q23 or Q58 to Corona and 51st Avenues and 108th st, and walk east into the park. By car, you can access the park directly from the Grand Central Parkway, Van Wyck Expressway, and Long Island Expressway. This NYC Zoo features an Aviary from the 1964 Worlds' Fair!